Whoopi Goldberg’s casting in Star Trek: The Next Generation, the sci-fi show which dominated American television syndication during the late 1980’s and 1990’s, brought an Oscar winners’ trademark persona to Gene Roddenberry’s sequel spin-off from his legendary Star Trek. Looking back 30 years later on her addition to the Star Trek family, the casting coup remains one of the most perfect for any Trek incarnation. Goldberg was brought on to the Galaxy Class Enterprise in the 2nd season as Guinan, enigmatic hostess managing the Ten Forward lounge. The bar and cool hangout soon became official watering hole for our hard working Starfleet crew. With the one of a kind Guinan joining up as recurring character on TNG’s cosmic trek, Captain Picard’s ship mates, along with the fans who loved watching them, would never be the same. Besides getting Goldberg’s playful humor, which punctuated the allure of the mysterious alien she played for six seasons, audiences enjoyed her serving as wry observer and frank commentator on the plentiful human drama which inevitably played out so colorfully around her. And no matter how incredibly alien or strange the guests were who visited Guinan’s place, she’d always manage to find the humanity concealed within the life form. Whoopi Goldberg appeared in the feature film, Star Trek: Generations, released in 1994, the same year of TNG’s final season. The comedian was also busy in 1994 for hosting “Comic Relief” – a charity telethon to raise money for the homeless broadcast on HBO. Co-hosted with her buddies Robin Williams and Billy Crystal, “Comic Relief” produced television specials raising over $50 million dollars for emergency housing and medical relief for the homeless. Comic Relief was a project universally embraced by all. It utilized enthusiastic participation and the support of the top of the Hollywood creative. 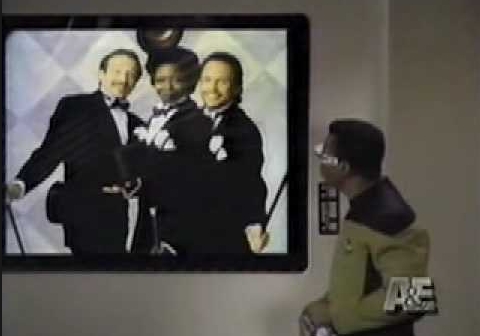 Since Whoopi acted as a recurring cast member on TNG, it’s no wonder the Paramount based show produced a comic sketch featuring our favorite Enterprise D crew members. The sketch runs just over two and a half minutes, but it’s a snappy, fun romp for our engaged Starfleet professionals. And we’re always reminded that the whole funny affair contributed to such a worthwhile charitable cause. 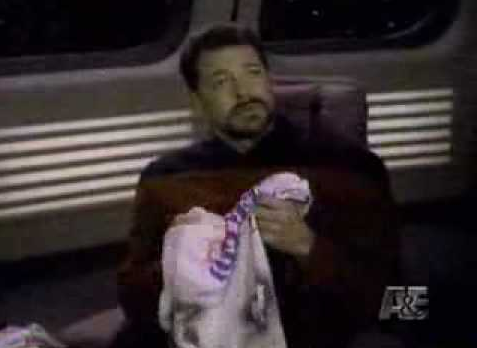 Watch Star Trek: The Next Generation’s Comic Relief sketch, featuring: Jonathan Frakes as Commander Will Riker, Marina Sirtis as Counselor Troi, Brent Spiner as android Data, Levar Burton as Chief Engineer Geordi LaForge, Michael Dorn as Security Chief Worf and Gates McFadden as Dr. Beverly Crusher. Exult in the high quality of the skit’s production values. Not many parodies can boast the budget or luxury of using such authentic trappings. Delight in in this uniquely clever comedy sketch played out on the actual Hollywood Trek sets. Above all, get ready to do a little sleuthing when comparing 24th century based Guinan to a surprisingly familiar 20th century comedian/actress known mysteriously as Hoo-Pye Goldberg. need to analyze any inventory. Including dividends, though, you’re closer to a 329% enhance. 660 now. Nott bad ffor doing nothing for three years (and that’s together wiith a large dip inn 2011-2012 following the whole value improve/Qwikster ordeal, however we’ll come again to that). this kind of solder iron necessitates stable hand mastery.